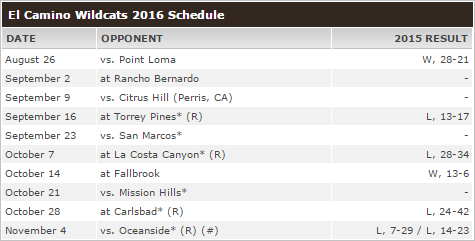 El Camino was riding high after a 5-0 start to the season, but ended up dropping their next five games. Despite the 5-5 regular-season finish, the Wildcats clinched a berth in the Division I playoffs and advanced to the finals, where their roller-coaster season ended with a 23-14 loss to crosstown rival Oceanside. After back-to-back 7-6 seasons under John Roberts, El Camino hired Jerry Ralph to take over the program. Ralph spent the last four seasons at Hoover, where he led the Cardinals to a 27-19 record and a city league title during his tenure. The Wildcats are looking to earn its first league title since 2001, when legendary Herb Meyer was still in charge. For that to happen, they'll need to survive a revamped Avocado League that features some of the best teams North County has to offer. Ralph will inherit an offense that returns six starters, including highly-touted junior running back Chris Brown (who is also a standout linebacker). Junior Jaden Casey returns for his second season as the starting quarterback. Casey is coming off a stellar sophomore year where he threw for over 400 yards in two separate games. He'll also have a big target in 6-foot-3 receiver Manuel Kariuki. “He will be hard to cover if defenses stack the box to stop Brown.” says Ralph of Kariuki. Quinn Kerwin, Jaylen Newman, Gideon Moore, Joseph Carvajal and Eddie Laie will power a very big offensive line that “no one knows about yet”. El Camino graduated it's top four tacklers and top two leaders in interceptions, but they get back defensive lineman Malu Malutumau and linebacker Rocky Katoanga; both (along with Brown) are expected to be impact players for the Wildcat's front seven this season. El Camino heads into the upcoming season with a very young squad that has been through some ups and downs during their prep careers, but tough experiences and a hunger to win should make these Wildcats a dark horse team to look out for.